From reintroducing keystone species and making wildlife corridors to sharing city space and engineering de-extinction, people are working to rethink the relationship between humans and the natural world. 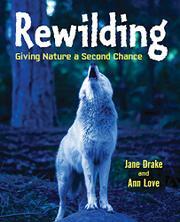 This evenhanded introduction to the concept of rewilding is lavishly illustrated with stock photographs breaking up the text and adding appeal for middle-grade and middle school readers. Topics are covered each to a double-page spread, presenting first rationale and definitions (rewilding, cores, corridors, and keystone species) and then examples from around the world, both species- and place-specific. The authors, Canadian sisters with a long track record of successful books about the natural world, write with an immediacy that will appeal to nature-loving readers, who will learn about efforts to restore habitats and repopulate them with native species. They discuss animals from trumpeter swans and American eels to butterflies and jaguars. There are success stories: peregrine falcons, back from the brink of extinction, live on city skyscrapers alongside humans; some commercial cod fishing has returned to Newfoundland. There are problems: no one has yet discovered where eels spawn; there isn’t enough room in a Netherlands wetland for the keystone species that would keep introduced herbivores in check. And there are interesting new wild spaces: the High Line in New York City; the demilitarized zone between the Koreas.